Who Is Kentucky? A Primary Tour in Black and White Sen. Hillary Clinton is expected to win Kentucky's primary Tuesday, a fact that one professor says is in no small part due to her opponent's non-white heritage. After all, the professor says, some students say they came to college never having met a black person. Kentucky: Where race remains a central issue and stumbling block for a black candidate. Among the last states to hold a primary, Kentucky is showing in polls that it will favor Sen. Hillary Clinton in Tuesday's voting, according to Donald Gross, a professor of political science at the University of Kentucky in Lexington. "It's likely going to be another Hillary Clinton state," Gross says. "She's way ahead of Obama, and there's nothing really that's going to fundamentally change to give him a victory." Like many Southern states, Kentucky votes Republican on a national level but continues to award its state-level offices to Democrats. Gross points to strong numbers of Protestants, fundamentalists and Baptists who tend to steer the debate toward social issues, such as abortion, upon which Clinton and Obama barely differ. "Like a lot of places as you move down South, it tends to be more conservative," he says. But Gross says Kentucky is one of those states that are hard to generalize by cardinal point. Just south of Cincinnati, it feels very Northern and Midwestern, while as you move toward Lexington the population is more traditional and genteel. To the far east is the Appalachian Mountain people, and to the far west the residents have the same patriotic conservatism common to southern Illinois' sleepy river towns. So where does that leave the Democratic candidates — and why is Clinton expected to win? To start parsing Kentucky's priorities, Gross points to the issue of race. 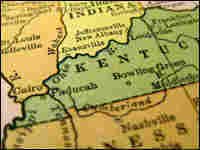 During the Civil War, Kentucky officially declared neutrality. It eventually sided with the North, but the fact that before the war it had been a slave state was not lost on vast segments of the population, who post-Reconstruction continued to steer the state toward pro-Southern policies. Even after 150 years, race remains key in Kentucky, Gross says, and is "clearly part of" Obama's low numbers in Kentucky. Compared with other similar Southern battlegrounds, where Obama has dominated, Kentucky has a significantly tinier black population. Gross reports having students of his at the University of Kentucky tell him they had never seen or talked to a black person before coming to Lexington, a college town of nearly 300,000 people. In some areas of Kentucky, Gross says there's perhaps only one or two black families there. Gross has an analogy for people's discomfort with Obama: "It's like taking someone from a small town and dropping them in the middle of China," he says. "They're not familiar with them ... they perhaps don't understand them." The result is that Obama is a tough sell for many Kentucky voters. "One doesn't see the overt racism one often thinks about," Gross says. "But in many parts of Kentucky, people are uncomfortable with African Americans."